Before Rachel and I started running we were, and still are, regular yogis (we have Laura to blame for passing on the running bug). Yoga twice a week became a regular thing but with our busy lives of working, eating and er.. lycra-ing it's sometimes hard to fit it all in. Last week we managed it though! While Laura was off having fun in Italy and France we finally got to try out Fat Buddha Yoga with the lovely Jessica. Our class was at The Book Club in Shoreditch. 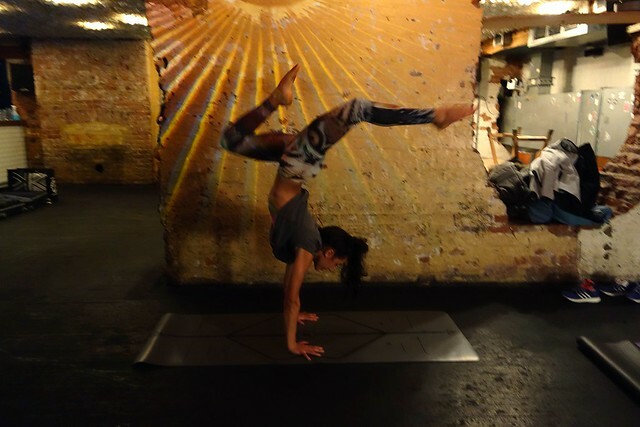 Now if you've been to The Book Club you will know that it is not where you would imagine a yoga class to be, in fact if you know it well you would expect dancing, loud music and a lot of people drinking. So we indeed were questioning the location. When we got there we were instructed down to a dimly lit basement where a set of yoga mats were laid out ready on the floor. A cool room lit with swirling images projected on the wall. The only give away that the basement was a club by night was the bar across the room, which was closed at this time of course. Not too shabby at all! We got our yoga mats out to put on top of the yoga mats already provided for that extra bit of cushion against the floor. Jessica helpfully suggested this to us before hand. 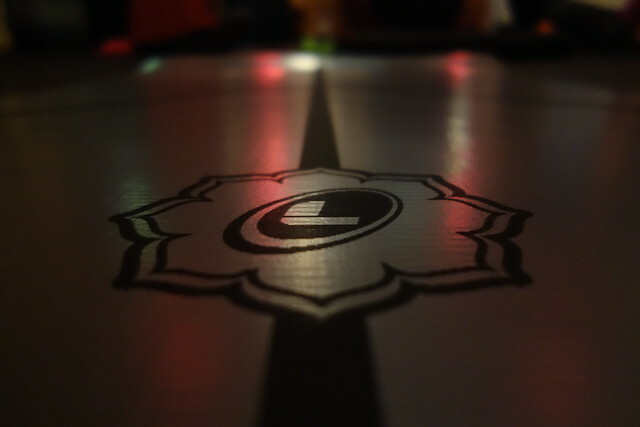 Above is the Liforme yoga mat, possibly the best yoga mat I have ever stepped foot on. I won this at the Lunges & Lycra social event and I can't tell you how good it is. 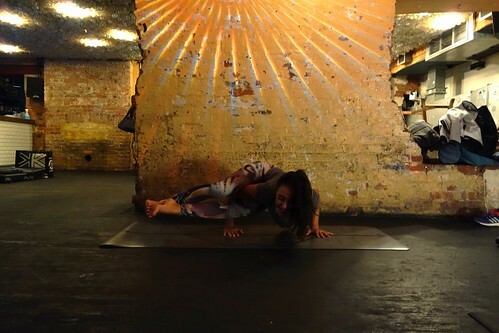 I no longer slip in poses and my hands don't slide across the mat. Even our instructor Jessica had a go on it and was amazed- thanks Liforme! Once everything was in place the class quickly started. The class was Vinyasa Flow yoga. 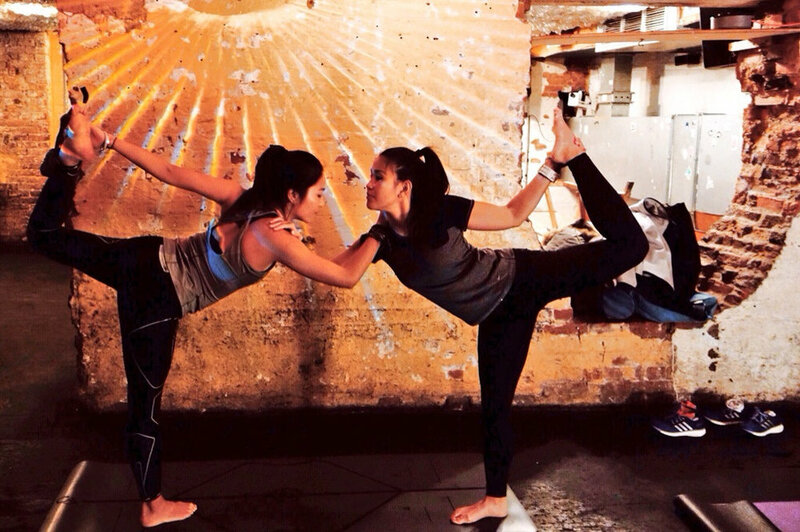 Yoga that gives us a good workout and makes us sweat is what we love but seriously Jessica worked us HARD! 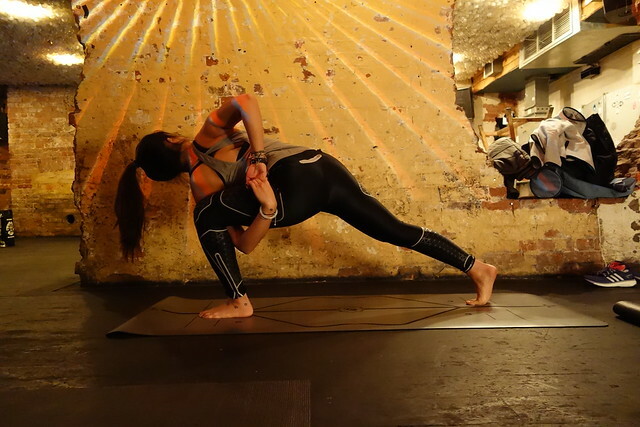 She eased us in at first but in no time the class moved swiftly on to more speedy sequences with great options for more challenging moves - Jessica even had us all doing one leg planks to one leg upward dogs to one leg downward dogs. We loved Jessica's teaching style. Really clear, concise, fast paced and with instructions all the way through. And she's definitely our kind of lady with her ultra cool lycra. The class ended with some core exercises and a quick massage from Jessica as we lay there in corpse pose. This was SO nice. 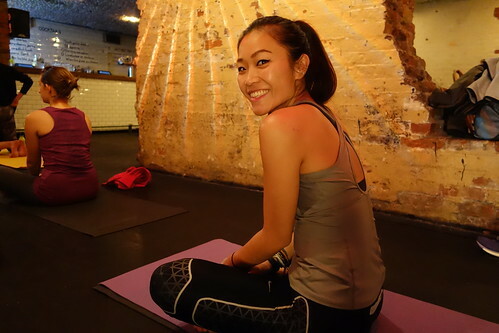 Yoga classes which end with a little massage from your teacher to really relax you are the best- great touch Jess! 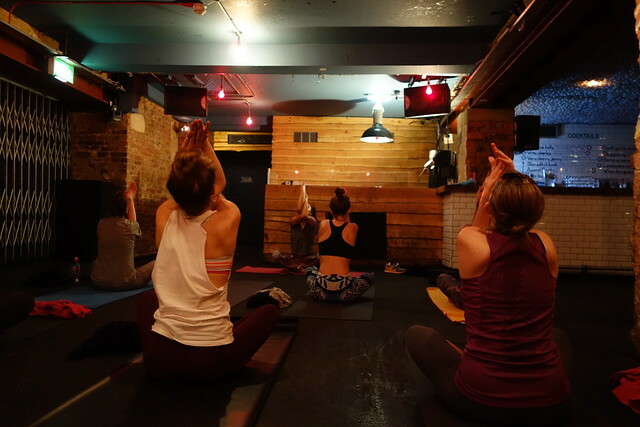 Here's where to find Fat Buddha Yoga classes over the next few months. Bookings powered by Fitness Freak UK of course! 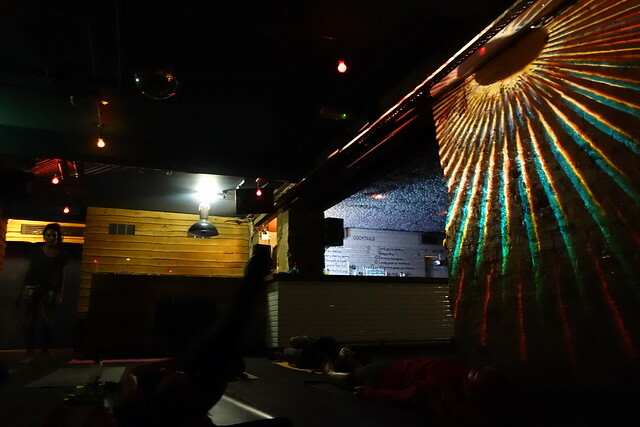 Hoxton Basement starting from 6:45pm available on the 3rd December and the 10th of December 2013. Book here. Need a quick stretch before work? Add this class to your new years' resolutions. Starting in January at 7:30am in the Google Campus near Old Street. Book here. This one is for the early birds. 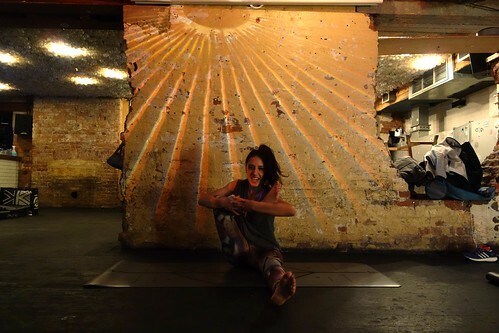 Saturday mornings at 9:30am starting on the 7th December in Dalston. Book here. Last class for December at 12:00pm at The Book Club will be on Saturday the 14th December. But luckily for us there will be more in the new year. 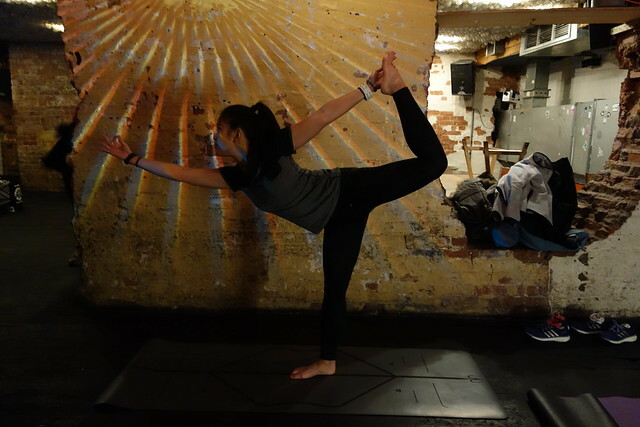 Book here to get your stretch on before Christmas 2013. 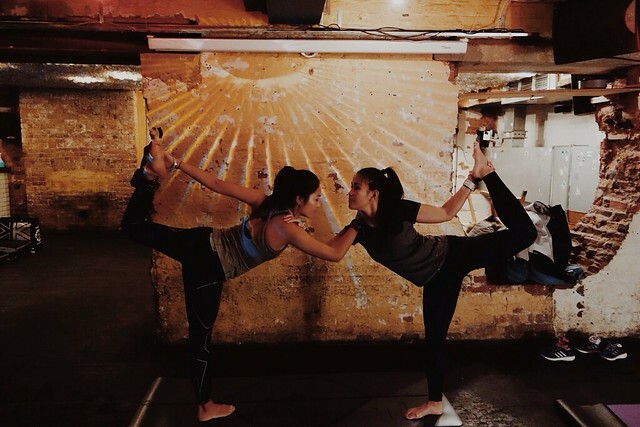 We'll definitely be back for more Fat Buddha Yoga soon! Do you do yoga? When's your fave time or day of the week to stretch it out?